Between the description of the victim having been "gloriously alive" and the Sunnybrook emergency physicians as "trauma docs" I thought maybe Montreal's late, unlamented 'Allo Police' had made a comeback. Either that of Blatchford was channelling Walter Winchell from the afterlife -complete with fedora, cigar and battered Underwood. There's 8-million stories in the Naked City. Maybe between having her trenchcoat sent out for professional rumpling and cleaning her own gat at her desk, Blatchford can relate a few more of them. Given that Blatchford's particular brand of writing went out of style fifty years ago, some people might have trouble understanding what she's saying. To that end, I include this handy "conversion table." All the words in the Blatchford column come directly from her own nauseating writing. Christie Blatchford's articles this week clinch gold, silver and bronze in the columnist olympics. The thoughtfulness and compassion of her piece on Eric Lamaze's remarkable achievements (Grace And Aplomb From the Horsey Set's Bête Noir -- Aug. 22) illustrates the folly of blog-yap described in her column I'm Not Blogging This, Mark My Words (Aug. 21). Whether writing about the love between woman and dog, the latest tragic murder of a child fallen through the cracks, the worlds of politics or sports, Ms. Blatchford consistently and with panache embellishes her personal best. To paraphrase from her article New Breed Of Athlete Is Higher, Faster and Scrappier (Aug. 20): This is what a real writer looks like; Ms. Blatchford is hopefully the archetype of the future Canadian journalist -- a scribbler with the gumption to demand the best from herself and her news organization and the mental and physical fortitude to deliver big every single day. And let's not forget her huge heart. Needless to say, this letter left me dumbfounded. Given Ms. Akeman's overblown and clichéd style of writing, I can't help but wonder if this is La Blatchford herself writing under a nom de plume. So Ms. Akeman waxes poetic over the brilliant writing style of Christie Blatchford. Amazing. Absolutely amazing. She even hopes that all Canadian writers will one day write like Blatchford. Her dream is that all Canadian journalists should write in pseudo-hard bitten, saccharine drivel? Chacun à son gôut, as they say in Quebec. And one additional point: the Globe and Mail very infrequently publishes letters to the editor in which one of the columnist's writing style is praised. So on the rare occasion that they do, they choose one extolling the talents (or should I say "talents") of Christie Blatchford???? The mind reels. A journalism student contacted me with some questions about La Blatchford. I include her e-mail and my response to her in the hopes that this clears up any misunderstandings about my feelings about Christie Blatchford and her absolutely horrible writing style. Hi there, I am a journalism grad student who is interviewing Christie Blatchford on Monday. I came across your website and am genuinely surprised at your criticisms because those I've spoken with had nothing but good things to say about her. Regardless, I am intrigued. I am hoping you don't mind answering some questions. Are you a critic by profession? Are you a writer? Where did your hate for Christie stem from? And, (I have to ask), do you think you might actually be in love with her? Have you tried to communicate your criticisms to her? How did that go? Would you like to pass along any messages via me? Anything you recommend I ask during my interview? Who are your favourite journalists? I notice you hate Rosie DiManno, too. Are you a misogynist? I hope you don't find any of these questions offensive. They are off the top of my head, as inspired by your website. Any input you have would be greatly appreciated. Hello there: Thank you very much for your note. No, I’m a fine arts specialist, with a focus on the works of Vincent van Gogh. Well, that’s just it. I don’t hate Christie Blatchford at all. How could I? I don’t know her. I should probably rephrase parts of my silly webpage. The opening lines where I talk about hating her are more for comic effect I suppose. What I do hate is Christie’s absolutely terrible writing style. More on that in a moment. Uh, no. Not at all. I find nothing attractive or admirable about Christie Blatchford. And I’ve heard through the grapevine that she’s got an abrasive personality (she’s talked about this in her columns before), has no life outside of her “writing” and if any editor suggests changes, she’ll throw a hissy-fit. Again, I don’t know the woman at all, but from what I can gather she’s a thoroughly unattractive and unpleasant human being. Oh, certainly. We had a few exchanges. She pretty much dismissed me as a crackpot. Partly because of my webpage, but mainly because of my suggestion that her writing style is appalling. She simply can’t fathom that she’s not the world’s most brilliant journalist. The sad thing is that Christie Blatchford actually believes she’s a good writer. She’s that deluded. By the same token, George W. Bush is absolutely convinced that he’s been a good president. Go figure. 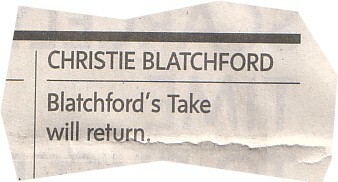 Of course, Blatchford never wins any proper journalism awards so that should give her some clue. But we don’t correspond any more. I found our exchanges to be quite humorous, but eventually she tired I suppose of being called a hack writer. Oh, you’re welcome to say that I feel that there’s no place for Christie’s brand of cloying purple prose in the Globe and Mail. Again, I would ask that you review my webpage once more, not with a focus on my disdain for Blatchford herself, but instead paying particular close attention to the many examples of her terrible writing. As a journalism student yourself, do you see anything positive about this type of over-the-top, saccharine garbage writing? Look at the Globe’s Graeme Smith, for example, and his reporting from Afghanistan. Fine, capable writing. Informative, but not cloying. Smith reports in a straightforward and intelligent manner. Blatchford, on the other hand, refers to the Canadian troops as “mighty” and “magnificent.” Mies van der Rohe said “Less is more.” Blatchford might actually be a competent writer if she eliminated the drivel (of course, that means scrapping 90% of her output). Blatchford would never answer any question I would propose ("How can you believe that the saccharine garbage you write is actually good?" or "You milk the worst human tragedies for your appalling columns like a vampire--how do you sleep at night?") No, Blatchford wouldn't answer any of my questions, so my advice is to just play it by ear. That’s a good question. In the Globe I like Graeme Smith, Stephanie Nolen (wonderful writing—Blatchford should take notes) and Margaret Wente (very good writing, even though I often disagree with her opinions—her thoughts on global warming are incredibly irresponsible). Ian Brown’s recent series about his disabled son, Walker, was absolutely brilliant. Some of the best writing I’ve ever read. I read the New York Times and like Nicholas Kristof, Frank Rich and Maureen Dowd. I bought Maureen Dowd’s 2004 book Bushworld. Another journalist I admire is Hendrik Hertzberg of The New Yorker. Never a bad column. Absolutely not. As I mentioned I like Stephanie Nolen, Margaret Wente and Maureen Dowd. And I’m not thrilled with the Globe’s Rex Murphy or John Doyle. And that hardly makes me a misandrist. Are you familiar with Rosie DiManno’s writing? Absolutely garbage, just like Blatchford’s. I remember reading two of Dimanno’s pieces. The first was when the Blue Jays first won the world series. I’m paraphrasing, but it was very close to “The boys of blue, the boys of summer, diamonds are forever. Ohboyohboyohboyohboyohboyohboyohboyohboyohboy.” Mental meltdown journalism. Another time I was in the gym, desperate for something to read, the day after American troops pulled down the statue of Saddam Hussein in Baghdad—and there was the Toronto Star. Dimanno wrote “The land of the free and the home of the brave, my country ‘tis of thee, America the beautiful . . . . . they did it. Goddammit they did it. And it’s to Canada’s eternal shame we weren’t there standing side by side with them.” Again, a decent newspaper shouldn’t allow this type of putrid writing. And, as it turns out, look how well the whole Iraq folly has turned out for the Americans. Dimanno’s a terrible writer and, politically, is a complete idiot as well. No, I’m absolutely not a misogynist and I do admit that the whole “hate” thing toward Christie Blatchford is overplayed on my webpage. The truth is, that page was just put together on a lark, but I confess that I do take pleasure in exposing Christie Blatchford, using her own horrendous writing, for the absolutely abysmal “journalist” she is. Anyway, I hope that you’ve found this helpful. Good luck with your interview with Blatchy. My advice, for what it’s worth, is that if you want to be a good journalist, you should find out as much as you can about Christie Blatchford’s approach to writing and then aspire to do the polar opposite. A second factor, I think, is that every story now, whether it is about Paris Hilton or the mission to Afghanistan, is subject to the same unquestioning hyperbole. As with the 3 October 2006 entry above, one's head swims when considering the depths of Blatchford's hypocrisy. If Blatchy had her way, Canadian troops would be in Afghanistan for the next century--and no one would ever question the wisdom of the mission. Who cares if there are no milestones in place for Afghanistan to eventually secure its own borders? Stay the course! Our mighty Canadian fighting heroes deserve no less (than to spend the remainder of the 21st century in Afghanistan getting their heads blown off). And Blatchford dares to use the word "hyperbole" to criticize the writing of others? Blatchford makes a living shoveling the most cloying and insufferable hyperbole on the planet. Talk about the pot calling the kettle black. The trial of a thirteen-year-old girl from Medicine Hat, Alberta is just the sort of sensationalistic fodder that Christie "Vampira" Blatchford loves to exploit. Day after day she follows it with her over-the-top garbage writing. The [murdered] boy's six-year-old friend from next door came upon the bodies on April 23, 2006, when he went over to see if his friend could come out and play. His mother testified yesterday that her son saw "bodies with blood on them." She saw the same thing and called 911. The little moppet's rosy, red cheeks were like two sweet little apples. He went to his neighbour's to see if his friend could come out to play. Maybe they could play tag or, bless their hearts, hide and seek. But this boy would find no playmate on this gruesome day. Instead he would only find the icy fingers of death. Bottom line: A newspaper writer (or in Blatchford's case: "writer") should stick to the facts and not dress up their prose with cloying hyperbole. Dawn Walton perfectly illustrates good journalism. Christie Blatchford is the complete antithesis of it. Christie Blatchford is only one day into the new year and already she's made a complete fool of herself. Indeed, I may be the only one who finds something unsettling in [the letters], and almost certainly am the only one inspired to near-violence by it. This, from a boy in Grade 6, was not atypical: "Dear Peacekeeper: Thank you for making peace in other countries. I know you are struggling to make peace in other countries like Afghanistan. They do not have peace there, so you want to bring peace. I think that being a peacekeeper is not easy and it's difficult but I thank you a lot for your efforts. Thank you for making peace." The message was inside a hand-made card decorated with a hand-drawn stop-war button, a peace button and hearts and poppies. I wanted, badly, to blow it up. Blatchford goes on to quote other letters of the same nature. Letters from young school children sending their best wishes to Canadian troops. She then says that she was barely able to restrain herself "from setting the lot of them on fire." Now there's no question that Christie Blatchford is a horrendously bad writer. I mean, that's a given. That's like saying that Bill Gates is extremely wealthy. One can't argue the point. But in addition to being a terrible writer, I can't help but think that Christie Blatchford appears to be certifiably insane. I hope that leaders in the Canadian military and the ever-oblivious editors of the Globe and Mail are made aware of Blatchford's latest article. She should be sent home today and placed in immediate mental care. She's clearly lost her mind. I can't stand Christie Blatchford's god-awful writing and endless self-congratulatory articles. Blatchford's writing has always sickened me, frankly. But after today's article I can't help but admit I feel a small glimmer of pity for the woman. Christie Blatchford proves, yet again, to be an embarrassment to the Globe and Mail. Jeff Esau of the Canadian Press reported today that four Canadian journalists, including Christie Blatchford, were expelled from their mission embedded in Afghanistan earlier this year. In addition to Blatchford, the other journalists removed were photographer Louie Palu, Toronto Star columnist Rosie DiManno* and Ontario-based freelance filmmaker Richard Fitoussi. The expulsion of these four journalists (or should I say photographer, filmmaker and two "journalists") reportedly came about as a result of complaints from Canadian allies who found their presence disruptive. Canadian Brigadier-General David Fraser, generally a supporter of Canada's embed program, made the decision to send the four Canadians packing. Intimate, blood-soaked coverage is what usually follows such shootings now--yesterday's was the third school shooting in the United States in less than a week, the fourth in North America if our own recent one at Montreal's Dawson College is included--and while I recognize it is inevitable that such events are covered, and though I am a participant in the print end, it seems to me that in my business, we may be feeding some awful beast out there by doing so. Wait a minute! Christie Blatchford has the gall, the unmitigated gall to accuse others in the media of exploiting stories of human tragedy when she in fact has made a career out of it??? Christie Blatchford, of all people calls this type of exploitation an "awful beast" when she herself is the worst culprit. Some horrible tragedy takes place, especially involving young children, and Blatchford squeezes it for all it's worth--like a starving boa constrictor. The hypocrisy of this woman is mind boggling.